Champions of the Horde! Your War Chief Commands You! The Legion is upon us! It is time to bring the fight to the Legion with our advancement on the Broken Shore and destroying the gateway that protects the Tomb of Sargeras! Patch 7.2 has dropped new content over the next few weeks. This begins with the unlocking of new artifact traits, appearances, Mythic +, and a new dungeon called the Cathedral of Eternal Night. Join your fellow brothers and sisters in fighting the Legion during the Broken Shore Assault EPIC OPERATION starting April 21st through May 6th. To gather groups to participate in all variants of content in World of Warcraft. This includes Invasions, Mythics and Mythic +, Raids, PvP, and World Quests. Is this only Broken Shore content? No. Anything you do that is a valid BWC operation (three or more BWC members including you, for at least 45 minutes) counts! That Mythic+ you grabbed a couple of guildies for, Counts! Grouped up to smash world quests, Counts! Organized a naked gnome run? Counts! Get OpServ trained (no trainings posted or time doesn’t suit? Put in a request). Group up with other BWC members to assault the Legion, or explore other WoW content. Use OpServ to coordinate your group, or post your adventures in OpServ afterwards for a spur-of-the-moment activity. Please use the [BSA] tag in your op title. Not on server? Not a problem! Use Blizzard ID to group up cross-realm. The leader of each operation run during the Broken Shore Assault Epic Operation will be entered into the draw to win a Blizzard Store mount or pet of their choice (excluding the Warforged Nightmare). Multiple entries possible, excludes WoW C&S. All WoW members who attend at least one operation during the Epic Op will be entered into the draw to win a Blizzard Store mount or pet of their choice (excluding the Warforged Nightmare). One chance per person, including operation leaders. WoW Broken Shore Assault Tier 1 - Awarded to members who have led at least one WoW operation during the Broken Shore Assault Epic Operation. 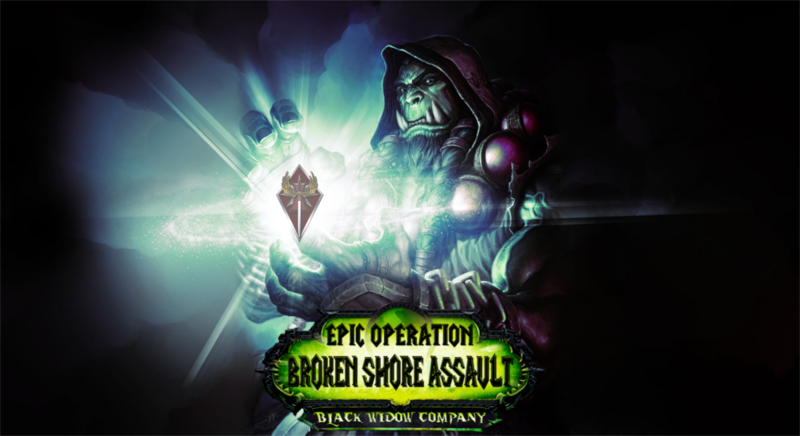 WoW Broken Shore Assault Tier 2 - Awarded to members who have led at least one WoW operation, and participated in 5 or more WoW operations total during the Broken Shore Assault Epic Operation. The EPIC OPERATION is already posted in OpServ, you can sign up here. The EVENT SCHEDULE can be found here. Add in any ops that you're planning. World of Warcraft is a supported game in our Conquest Division and offers all BWC members a great opportunity for quality gaming, team building and event participation. Featuring tactical variety, fun and engaging gameplay mixed with competitive elements, World of Warcraft espouses the “One Team, One Fight” ethos that BWC centers itself upon perfectly. Attend a WoW operation, training, and/or FTX and earn credit in the 2017 “One Team One Fight” (OTOF) Campaign. Learn more about the OTOF Campaign HERE. Time for a fun and light weekend event to celebrate Easter! The spring chicks are chirping... the bunnies are hopping around...and the smell of large lasers melting armor drifts across the fields of the Inner Sphere. So grab your melting chocolate and strap into your cockpit, because these prizes aren't going to find themselves. You can read the full contest rules HERE. Dark Chocolate Achieve a Kill Most Damage Dealt or Kill against 1 Clan Light, 1 Clan Medium, 1 Clan Heavy, and 1 Clan Assault Easter Surprise! Milk Chocolate Achieve a Kill Most Damage Dealt or Kill against 1 IS Light, 1 IS Medium, 1 IS Heavy, and 1 IS Assault Easter Surprise! MechWarrior Online is a supported game in our Battle Division and offers all BWC members a great opportunity for quality gaming, team building and event participation. Featuring tactical variety, fun and engaging gameplay mixed with competitive elements, MWO espouses the “One Team, One Fight” ethos that BWC centers itself upon perfectly. Attend a MWO operation, training, and/or FTX and earn credit in the 2017 “One Team One Fight” (OTOF) Campaign. Learn more about the OTOF Campaign HERE. All times are GMT-5. This page was generated at 00:50.